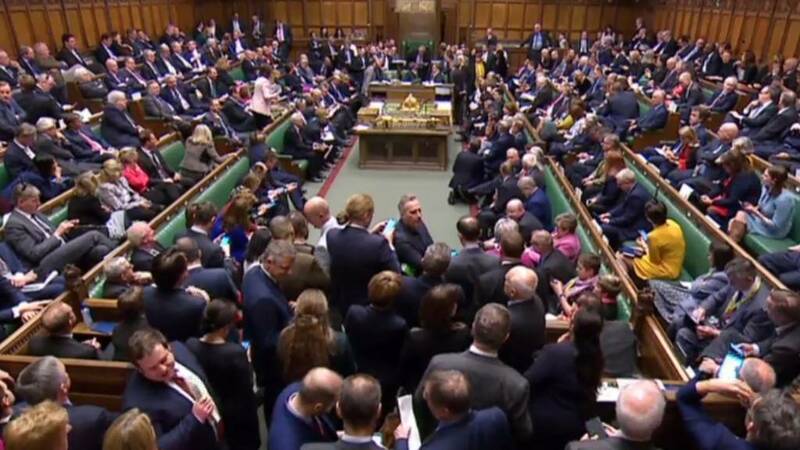 Downing Street called the talks "constructive"
Mr Corbyn called them "useful but inconclusive"
MPs are going to continue voting, however this is where we have to leave our live text coverage. You can still following proceedings on the video at the top of the page or by tuning into BBC Parliament. Click here for the latest updates to the story. MPs are now voting on Bill Cash's new clause 4. This is a particularly procedural one. It prevents amendments to standing orders during the motion on extension - standing orders are the rules that govern the proceedings of Parliament. The amendment tabled by Anne Main has been defeated by 488 votes to 123. The Conservative MP's amendment would have place a limit on an extension to Article 50. MPs are now voting on amendment 1. This has been tabled by Conservative Anne Main and puts a limit of 22 May to any extension. A "programme of work" is agreed while Jeremy Corbyn calls the talks "useful but inconclusive". The government was defeated on amendment 22 by 180 votes. This makes it the second biggest defeat in modern times. 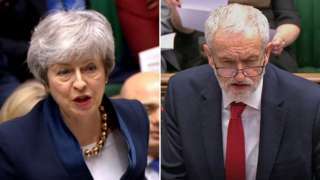 The biggest ever defeat was the first meaningful vote on the prime minister's deal. MPs have voted against the government's amendment 22 by 400 votes to 220. This amendment would have ensured that nothing in the bill could have limited the power of government to seek an extension in their own way. What are MPs voting on now? Had it been supported by MPs, amendment 21 would have taken out the requirement for the prime minister to put the EU’s chosen extension date to MPs. MPs are now voting on amendment 22. This is a government amendment which makes sure the bill does not limit the power of government to seek an extension in their own way. MPs have voted against amendment 21 by 313 votes to 304. Labour's Yvette Cooper says she will support the government's new clause 13 but urges MPs to oppose the other amendments. The debate ends and MPs begin voting. The first amendment to be voted on is amendment 21 which takes out the requirement for the prime minister to put the EU’s chosen extension date to MPs. Brexit minister Robin Walker says the government is amending the bill, not because it supports the proposed legislation, but because it wants to "limit its most damaging effects". He says he continues to urge MPs to reject the bill. He argues that it is not needed because the government has already said it will seek an extension to prevent a no deal. Shadow Brexit minister Paul Blomfield says Labour will also oppose those amendments which seek to set an exit date. "We really should have learnt that putting exit dates into law denies the flexibility we might need," he says. The SNP's Europe spokesman Peter Grant says his party will vote against anything that seeks to limit any extension to a matter of weeks. He says it is "nonsensical" to think that the prime minister's deal can be improved in a short period of time. He says the prime minister's deal can only be improved "if we get a longer extension".